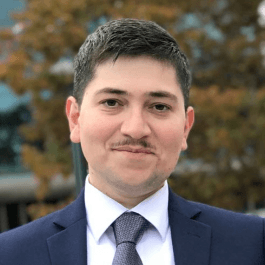 Obtaining his Master of Engineering Leadership in Urban Systems was “absolutely worth the investment of time and money” says Mustafa Khalid, who is now working in a managerial role in the construction industry. Mustafa Khalid says going to grad school was always one of his goals. “I wanted to work for a few years to build my experience in industry and then return to school with a greater understanding of what I wanted to focus on,” he says. After graduating with a degree in civil engineering in 2013, he took on roles of increasing responsibility with Kiewit, working as a project engineer on hydroelectric projects in Manitoba. The Master of Engineering Leadership in Urban Systems program appealed to his growing interest in how engineering and technology can address some of the challenges faced by today’s cities. Mustafa says he appreciated that the MEL classes focused on real-world problems and projects rather than academic theory. Mustafa is back working with Kiewit, this time in Burnaby, BC, and now in the role of assistant manager on the Trans Mountain Project. He’s taken on greater responsibility with a significant increase in project budget and scope from his previous positions with the company. His work involves identifying project risks and developing and implementing mitigation and contingency plans, as well as helping the project team develop the pre-construction planning process and specifications.